Ethel Mairet (1872 – 1952) was a handloom weaver and dyer and a pioneer of the 20th-century modern craft revival in Britain. She was influential in the development of weaving in the first half of the 20th century and she was an enthusiastic and inspirational teacher, dedicated to passing on to future generations the knowledge and experience gained from her lifetime of experimentation with natural dyes and textiles. Her first husband was the geologist and art historian, Ananda Coomaraswamy, and with him she spent some time at Charles Robert Ashbee’s community of artists and craftspeople in Chipping Campden. The couple also travelled to Ceylon (now Sri Lanka) and India, where they collected textiles and Ethel Mairet learned about handweaving. In 1913 she married her second husband, Philip Mairet, and they established a joint home and studio near Stratford-on-Avon. In 1914 she was visited by Gandhi, who knew of her work in Ceylon and was interested in using simple textile techniques in India. In 1916 she visited Eric Gill and the Guild of St Joseph & St Dominic in Ditchling in Sussex. This was a Roman Catholic community, based on the idea of the medieval guild, which existed for the protection and the promotion of the work of its members, who included Eric Gill, Hilary Pepler, Valentine KilBride and George Maxwell. Ethel Mairet was so impressed that she decided to set up her weaving studio in Ditchling and during the 1930s and 1940s she trained people in weaving and natural dyeing in her studio at her home “Gospels”. In 1939 she became the first woman Royal Designer for Industry (RDI). In common with many of her Ditchling contemporaries, Ethel Mairet shared the view that the sustainability of craft lay in communicating with a new generation of practitioners and between 1939 and 1947 she taught at Brighton Art School, favouring experimentation rather than technical expertise. Her book on natural dyeing, “A Book of Vegetable Dyes”, was published in 1916; it was one of the first British books on natural dyeing to reach a wide audience and was so successful that it ran to five editions (including a version published by Hilary Pepler’s St Dominic’s Press). Although some recipes in “Vegetable Dyes” include chemicals considered unsuitable for use in today’s safety-conscious and environmentally-concerned world, the book remains a classic work which still has much to offer the natural dyer. Ethel Mairet also published books on handweaving, including “Handweaving Today” (1939) and “Handweaving and Education” (1942). 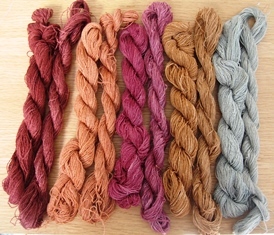 I have dyed 10 skeins for the project and they are shown in the photo below. In each pair the first skein is cotton and the second skein is linen. All were mordanted with 5% alum acetate.